After spending the summer in Africa on an archaeological dig, students from the Lewis Paleobiology Lab and the Biological Sciences Graduate Student Organization decided to make a difference by collecting items for the children living there. The Koanaka Kids Project is seeking such items as small toys, sports equipment, picture and coloring books, pens, paper, clothes and shoes. Picture books are necessary because they speak a different language, according to junior biology major Alicia Kennedy. “The children we want to help come from a small village in northwestern Botswana called XaiXai,” she said. “This is village consists of about 500 people from two different tribes of San Bushman. Collection boxes have been placed in the Student Advising and Mentoring Center, Newton Gresham Library, Lee Drain Building Rooms 103 and 200, the Lowman Student Center, the Academic Building II Computer Lab, the Health and Kinesiology Center and many other buildings across campus. The boxes will be in these locations until Dec. 4. In addition, the groups will accept monetary donations to help defray shipping costs. Monetary donations can be made in the Paleobiology Lab, in LDB Room 103. Other events being planned to benefit the Botswana include a T-shirt and wristband sale scheduled for November and a “Climb for Koanaka” rock-climbing event in January. For more information, contact Tim Campbell at 936.294.1545 or Patrick Lewis at 936.294.3397. The SHSU Women’s Basketball team is looking to raise some ‘green’ during its inaugural Four-Person Golf Scramble Tournament” on Nov. 3. The tournament, which will also include a silent auction, will begin with a shotgun start at 9 a.m. The registration fee is $125 per golfer, or $450 per team, which includes one round of golf, range balls, cart fees, lunch and gifts. Hole sponsorships are available for $100, as well as tournament sponsorships, available for $1,000, which will allow for a round of golf for four players, a barbecue lunch, drinks, free gifts and exclusive advertisements on the first and 18th holes. All proceeds benefit the women’s basketball program. For more information, or for an entry form, contact Jamene Caldwell at 936.294.3915. 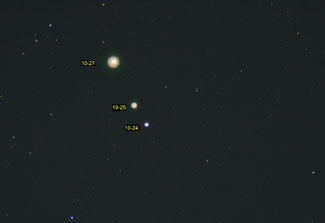 The Comet Holmes becomes more visibile between Oct. 24 to Oct. 27. The public can view the comet on Friday during the physics department's observation party. The physics department will host a public star party on Friday (Nov. 2) to observe the Comet Holmes. The party will begin at 7:30 p.m., with viewing beginning at 8 p.m., at the Observatory, located off of Highway 19 near Riverside. "Comet Holmes is currently glowing at magnitude 2.5 in the constellation Perseus," said Michael Prokosch, staff aide for the physics department. "That is bright enough to be seen with the naked eye, even from in town." A map with directions to the observatory can be find on the physics department Web site, at http://www.shsu.edu/~phy_www/. For more information, contact Prokosch at vis_mwp@shsu.edu or 936.294.3664. Donald Alexander, professor of economics at Western Michigan University, will look at why universities invest large sums of money in the provision of college sports on Thursday (Nov. 1). The Economics Fall 2007 Seminar Series lecture, "The Impact of Athletic Success on State Appropriations to Colleges and Universities," will be held from 3:30-5 p.m. in Smith-Hutson Building Room 139. Alexander has taught at WMU since 1991. He previously taught at Penn State and The College of William and Mary. His research interests include industrial organization, antitrust economics and economics of regulation, as well as the economics of sports and the telecommunication industry, on which he has written a number of books and articles. Alexander received his bachelor’s degree from Bowling Green State University in 1978 and his doctorate from Penn State University in 1983. A copy of the paper he will be discussing is available online at http://www.shsu.edu/~eco_www/resources/seminar_fall2007.htm. For more information, contact Hiranya Nath, associate professor in the economics and international business department, at 936.294.1265. Fans of such authors as Joan Bauer, Mo Willems, Cynthia Leitich Smith and Greg Leitich Smith will have the opportunity to learn from the professionals during the Children's Book Festival And Young Adult Conference on Saturday (Nov. 3). The “Pumpkins, Pigeons, Predators and Piranhas: Books for Children and Teens” conference will begin at 9 a.m., with registration from 7:45-8:45 a.m., in the Lowman Student Center. Bauer and Cynthia Leitich Smith will speak during the first general session, from 9-10:30 a.m., while Willems and Greg Leitich Smith will speak during the second general session, from 2:30-4 p.m. In addition, participants will have the opportunity to purchase books and have them autographed by the speakers. Registration is $150, which includes lunch, conference materials and an activity packet for the Texas Bluebonnet Books, and the deadline to register is Oct. 30. Information packets, including registration forms, can be found at http://www.shsu.edu/~lis_www/documents/2007SHSUconference.pdf. For more information, contact conference coordinators Mary Berry, Teri Lesesne or Holly Weimar at 936.294.1151. Elementary school-aged children will have the opportunity to learn about nutrition and animals during the 13th Annual Block and Bridle Children's Barnyard Wednesday (Oct. 31) and Thursday (Nov. 1). SHSU animal science club members will share their knowledge with more than 1,200 area children, ages 3-8 years old, from 8 a.m. to 2 p.m. at the Indoor Rodeo Areana Complex, located at the Ag Center. The event includes walkthrough pens, where children can pet docile farm animals, sit on a horse or learn to rope, as well as educational stations that explain the nutritional importance of milk, eggs and meat. "Agriculture has a huge impact on everyone's daily life whether they realize it or not," said Marcy Beverly, assistant professor of animal sciences. "You can't wake up in the morning, brush your teeth, or drive to school in the morning without something agricultural related." For more information, call Marcy Beverly at 936.294.1222. The Department of Student Activities will kick off a new speaker series designed to highlight each of the university’s five colleges with Frank Charles Winstead, who will share his passion for teaching on Tuesday (Oct. 30). The Student Activities Leadership Initiative lecture will be held at 11 a.m. in the Lowman Student Center Theater. Winstead is convinced that teaching is the most important job in the world, according to his Web site, Advocate for Excellence. He served in the public education field for 31 years in Georgia at the elementary, junior high, and high school levels, teaching at West Georgia College for two years and serving as a middle school principal for five years. He also served for 16 years as the director of educational media in DeKalb County, the largest school district in Georgia. The former “Outstanding Young Educator,” “Georgia STAR Teacher,” and “Outstanding Principal” retired in 1994 in order to speak and write full time. The SALI series will bring one-to-two speakers to campus each semester, according to Student Activities program coordinator Brandon Cooper. The free lecture will last for about an hour and a half, and there will be a question and answer session afterward. For more information, call 936.294.3861. The SHSU Staff Council will give employees a Halloween treat on Wednesday (Oct. 31) during the Annual Fall Staff Social. Lunch will served from 11:30 a.m. to 1:30 p.m. in the Lowman Student Center Ballroom. For more information, contact Sophia Polk, Staff Council public relations committee chair, at adm_sdp@shsu.edu. The Troutman Flag is one of 10 that will be on display as part of the "Flags of the Texas Revolution" exhibit in the Walker Education Center through Nov. 26. While many people may be familiar with the “six flags” of Texas, many may not remember the 10 flags of the state’s revolution for freedom from Mexican rule. The Sam Houston Memorial Museum will remind Texans of those flags as part of an exhibit on display beginning Monday (Oct. 29) in the Katy & E. Don Walker, Sr., Education Center's Exhibit Gallery. The independence of Texas is partly told by the story and change of the different flags of Texas within the last 150 years, according to David Wight, museum curator of exhibits. “The Flags of the Texas Revolution” is comprised of limited-edition replicas created by the Gallery of the Republic in Austin with the help of the State Archives. Only one original of these historic flags still exists and currently hangs in the State Capitol, Wight said. 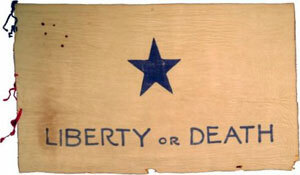 Among the flags in the collection are Captain Scott’s Flag, a navy flag with a white star and the word “Independence” written underneath; the Gonzales Flag, a white flag with a cannon and the words “Come And Take It” written on it; and the Dodson Flag, recognized as the first “Lone Star” flag. The exhibit will be on display through Nov. 26. For more information, call the Sam Houston Memorial Museum at 936.294.1832. The SHSU Faculty Brass will conjure up songs from the past on Halloween night as one of several concerts hosted by the School of Music for the week. The Halloween Monster Concert, which will be held at 7:30 p.m. in the Recital Hall, will include “the scarier movements” of Modest Mussorgsky’s “Pictures at an Exhibition,” some Renaissance music by Samuel Scheidt, and selections from “Pirates of the Caribbean,” according to Randy Adams, associate professor of trumpet and brass area coordinator. “It's sure to bring a smile to both young and old,” he said. The SHSU Faculty Brass is comprised of Adams and Steve Warkentin on trumpet, Peggy Demers on horn, Henry Howey on trombone and Bob Daniel on tuba. On Thursday (Nov. 1), the faculty members will present their “Various Voices,” at 7:30 p.m. in the Recital Hall. Faculty members Mary Kay Lake, singing soprano; Kathy Daniel, playing flute; Patricia Card, playing clarinet; and Ilonka Rus, playing piano, will perform “gorgeous works for voice and piano,” including Aaron Copland’s “As It Fell Upon a Day,” Gary Schocker’s “Airheads,” and David Rubenstein’s “Flames,” according to Card. In addition, the quartet will perform “Stopping by Woods on a Snowy Evening” by Jett Hitt, a former SHSU theory/composition faculty member. “Various Voices” will also be performed during the Artists Series as part of the Texoma National Association of Teachers of Singing at Southern Methodist University in Dallas on Nov. 9. Other concerts for the week include a chamber orchestra concert on Tuesday (Oct. 30), at 7:30 p.m. in the Recital Hall; and a choral concert on Saturday (Nov. 3), at 7:30 p.m. at the University Heights Baptist Church. 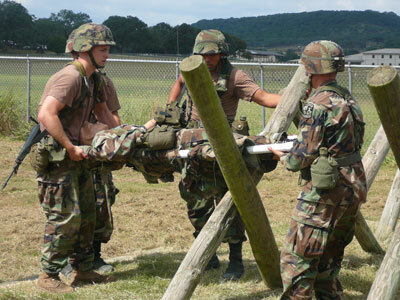 Cadets compete in the first aid obstacle course as part of the Camp Bullis Ranger Challenge. The co-ed team won first place in the course. Sam Houston State University's Ranger Challenge Team showed they were “Army strong,” finishing first and fifth in a competition at Camp Bullis, Texas, Oct. 12-14. The male and co-ed teams, "consisting of the some of the best cadets SHSU's Military Science program has to offer,” competed against 21 other universities from Texas, Oklahoma, and New Mexico, according to Lt. Col. Rick King, chair of the military science department. The SHSU Co-ed Ranger Challenge Team won first place overall for co-ed teams, also winning first place streamers in the Army physical fitness test, the first aid obstacle course, and M16 disassembly/assembly. The SHSU Male Ranger Challenge Team placed fifth overall among the male teams and also won a first place streamer for M16 disassembly/assembly. The SHSU Co-Ed Ranger Challenge Team is comprised of cadets Monica Lim, Emily Miller, Rhett Sanders, Artem Richards, John Girton, Ashley Livasy, Austin Harms, and Wayne Salizar. The SHSU Male Ranger Challenge Team is comprised of cadets Christopher Weinbel, Johnathan Crane, Mark Richardson, Andrew Enriquez, Patrick Nguyen, Arthur Tovar, and James Decell. "The SHSU Army ROTC has not placed first in this competition since 1996," King said. "This is an outstanding achievement for our cadets." The Ranger Challenge team met for physical training every morning and lab every afternoon for seven weeks, training hard for the eight events of the competition: the Army physical fitness test; a 10K (6.2 mile) ruck march; patrolling, land navigation, and first aid written test; the hand grenade assault course; first aid obstacle course; day orienteering; M16 disassembly/reassembly; and night orienteering. The U.S. Department of Education has awarded SHSU’s Ronald E. McNair Postbaccalaureate Achievement Program a $924,000 grant. The four-year grant provided $231,000 beginning this fall. The Ronald E. McNair Postbaccalaureate Achievement Program is designed to provide low-income, first-generation and ethnic minority undergraduate students with effective preparation for doctoral study. SHSU’s McNair Program encourages graduate studies by “providing opportunities for undergraduates to define their goals, engage in research, and develop the skills and faculty mentor relationships that are critical to success at the doctoral level,” according to program director Lydia Fox. Fox said the program’s students have consistently met its objectives at a higher rate of completion than the average performance of other McNair Programs across the nation. The program’s faculty advisory board includes the original authors of the grant proposal, including Kandi Tayebi, who also serves as principal investigator; Bernice Strauss, Alice Fisher and Beverly Irby.